Ordering Manual 3 On Page Business Payroll Checks is easy at Checkomatic.com; simply choose a color, send us a logo and fill in the personal and bank data required, and we’ll deliver the checks to your door. We take pride in our customer service ready to assist you at all steps, and are very pleased to announce next day delivery is available. As with all our products, order Manual 3 On Page Business Payroll Checks in bulk to take advantage of our discounts. Check o matic did a great job. I am re-ordering with them. 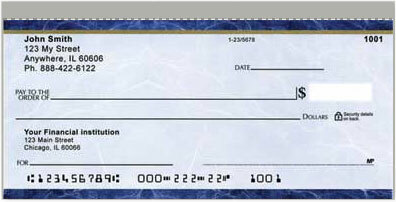 The checks are very neat, and are good Quality, I use it for my small business.